Ca 1870, elm, Cheon Chu City. City known for high quality furniture; original auspicious thick sculpted metal decorations; certified. 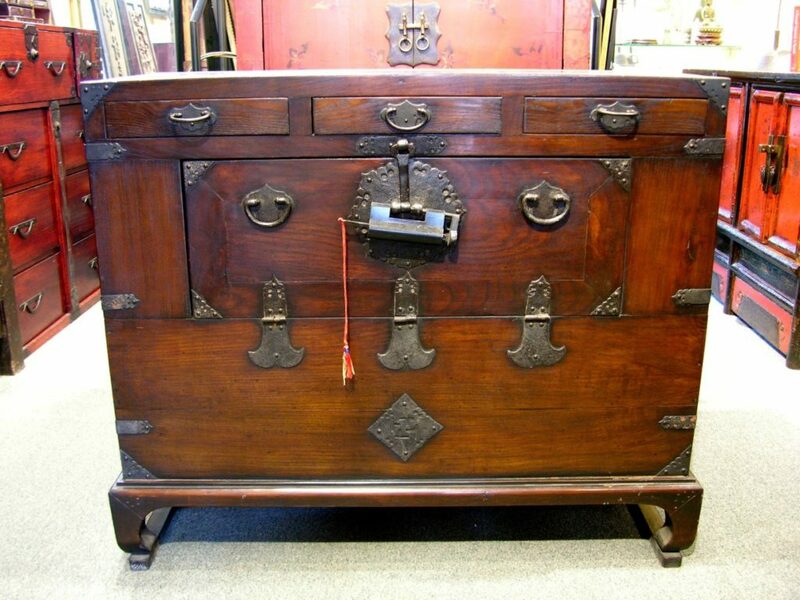 33½” h. 40¾” w. 19” d.
This chest was made for a scholar of the elite class because of the thick hand-carved ironwork with Buddhist symbols. Iron was preferred by Confucius-time scholars for its quiet strength and simple form without too much unnecessary decorations; they favored a piece of furniture for its dignity and grace. The thick metal gives the design a feeling of “sculptured bodies” and projects a sense of material the Korean craftsmen of yore are so famous for. According to a Korean antique expert, reproductions made today do not have thick ironwork like this one. The chest rests on a raised base with short inward curving legs attached to side foot stretchers. Except for some slight cracks in the back where secondary quality of wood was used, this authentic antique chest is in excellent condition. In Yi period, Cheon Chu City was where the land-owning Yangban class gathered to prepare to take an open Imperial Examination the passing of which guaranteed upward mobility. This class could afford to commission high quality furniture for their elegant homes. This chest is certified by a Professor of Korean History and Antiquity who was responsible for many antique pieces placed in museums.